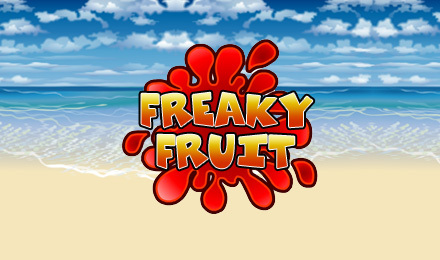 Go on a tropical holiday and play Freaky Fruit slots! This game is packed with adorable fruit symbols, Wilds, Scatters, and 2 exciting Bonus games! Enjoy the refreshing fruitiness of Freaky Fruit slots! This 9 payline slot is packed with delicious fruity fun against a seashore background! Lay back and relax while you spin to win this online slot offering the sweetest winning opportunities! The Bonus symbol will help activate the Tropical Cocktail bonus game that offers massive multiplied wins – up to 16,000x your bet! The Cherries are the Wild symbol and can substitute for other symbols and help you complete more winning combinations! Plus, grab up to 40 FREE Spins when you get 3 or more Pear Scatter symbols anywhere on the reels!